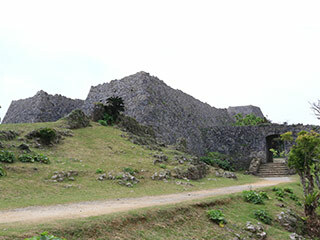 Nakagusuku Castle (中城城) is one of the ruins of Mountain Castle located in Okinawa. It was constructed in the late 14th century. It is a huge castle with many great stone walls. Most of the baileys and stones are remains in a great conditions. It is designated as UNESCO World Heritage Site. Because of the scale, it is also registered as 100 best Japanese castles, and national historic site. The castle contains 6 different baileys and top bailey is over 160m high. Arch style gate and Nunozumi layered Stones. Admission: 400 yen for adult, 300 yen for Junior and High, 200 yen for elementery school. 1. use local bus 30 to Kuba. Built in: 1440 by Gosamaru Moriharu. Nakagusuku Castle is the ruins of Hill top castles located in Okinawa. It was constructed in late 14th century. Okinawa developed with building stone wall structure because they have many Limestone that are very easy to reshape. Nakagusuku Castle has 3 different style of stone walls. Nakagusuku Castle is located on the small mountain. There are 6 different baileys and Stone Walls are remain in the great conditions. The height of the walls are so high and you can see hard structure as the fortress in Okinawa. This castle takes decades to construct and finished by Gosamaru. The top of the mountain is about 160m high from the sea level. The quality of the stone structure is very beautiful. Especially, stone gate are like Egypt style gate. In 1853, US Navy Adminal Perry praised to this castle when he saw this castle as the best stone structures.